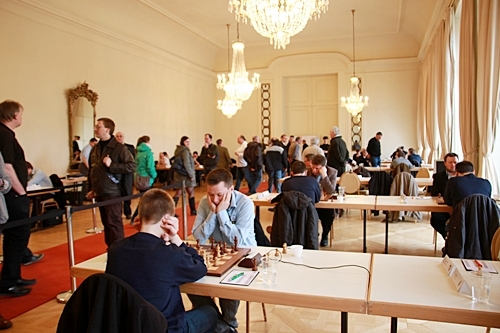 The German Chess Bundesliga took place from October 10th 2012 until April 7th 2013. This is the most important long-term club event in the world. This is the last weekend of the season, as three rounds were scheduled for this weekend. The first one, played today, is already over, and the favorite team of Baden-Baden has already secured first place in the standings, according to Fide chess news. Baden-Baden played against SG Trier and tried to avoid any surprises by showing some solid chess in most of the boards. The first five match-ups finished in draws, but the favorites squeezed two victories in boards 5 and 8 to get a 5-3 winning score. Peter Heine Nielsen defeated Hungarian IM Miklos Galyas with the white pieces in a very complicated game where the decisive mistake by Galyas came just before the time control. Baden-Baden’s strength is shown by the fact that they can get a 400-rating difference on the last board. This time, GM Phillip Schlosser (2579) defeated Lev Yankelevich (2178) to secure overall first place for the team.